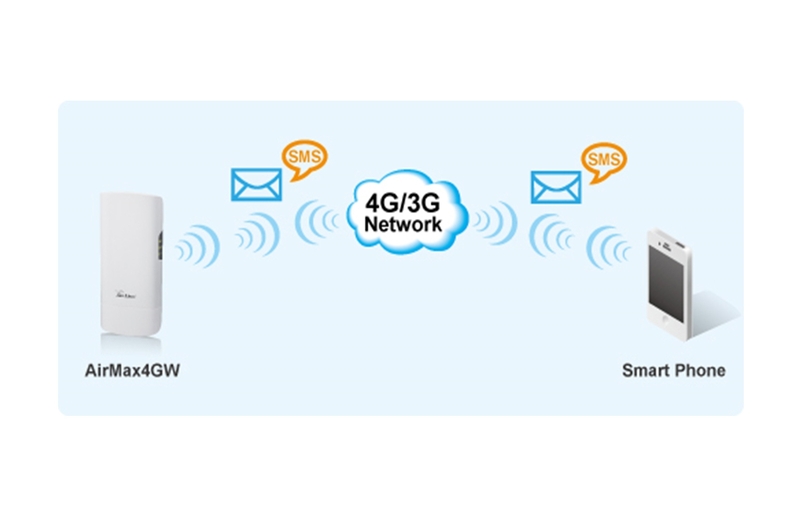 The AirMax4GW is a standalone 4G LTE outdoor gateway that can distribute 4G or 3G Internet signal through WiFi or Ethernet connections in any location. 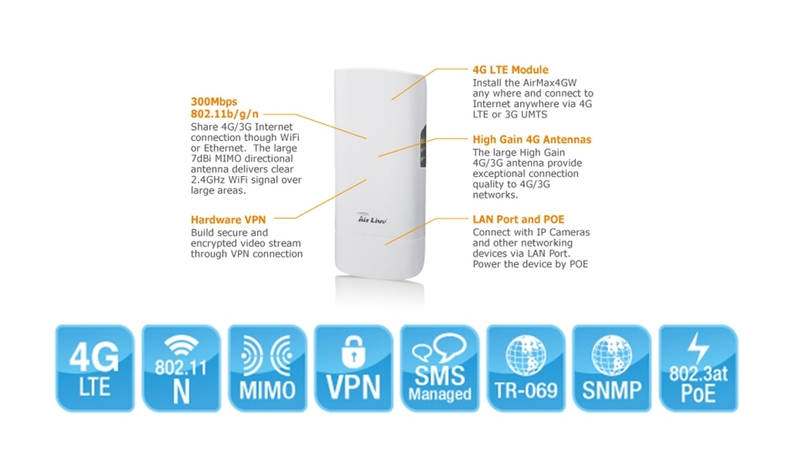 It is equipped with high gain LTE and WiFi antennas for better reception and transmitting distance. The AirMax4GW bridges the connections between WiFi, Ethernet, and the 4G LTE Mobile Network. 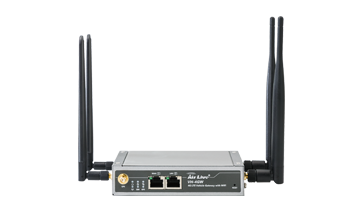 With AirMax4GW, you can connect any WiFi or Ethernet equipped devices to the broadband Internet. On the other hand, you can also provide Internet service coverage through WiFi in any locations. 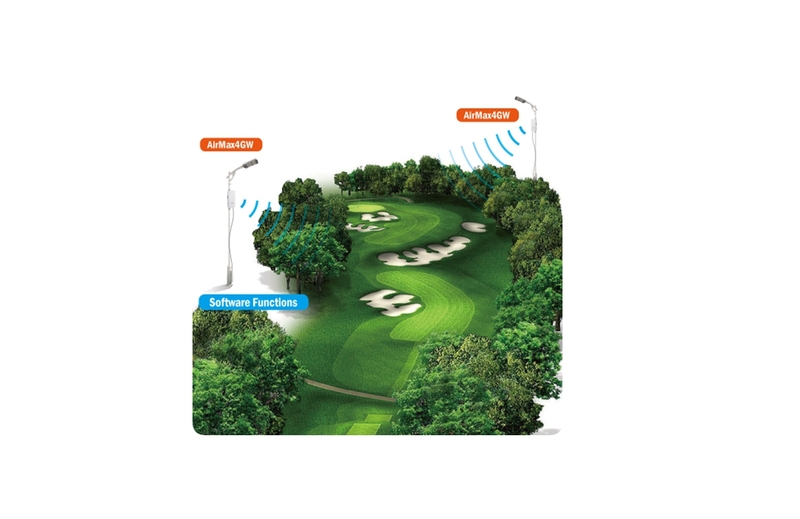 The AirMax4GW features high gain and high sensitivity 4G LTE antennas. So it can receive 4G or 3G mobile signal where normal mobile phone can not. In addition, it also has a high gain WiFi antenna which can send out wireless signal over large area. This is ideal for operators to install Internet service or connect networking devices to the Internet for their customers. If you want to install IP cameras in remote locations or in places where it is difficult to get Internet connections, the AirMax4GW is your best solution. 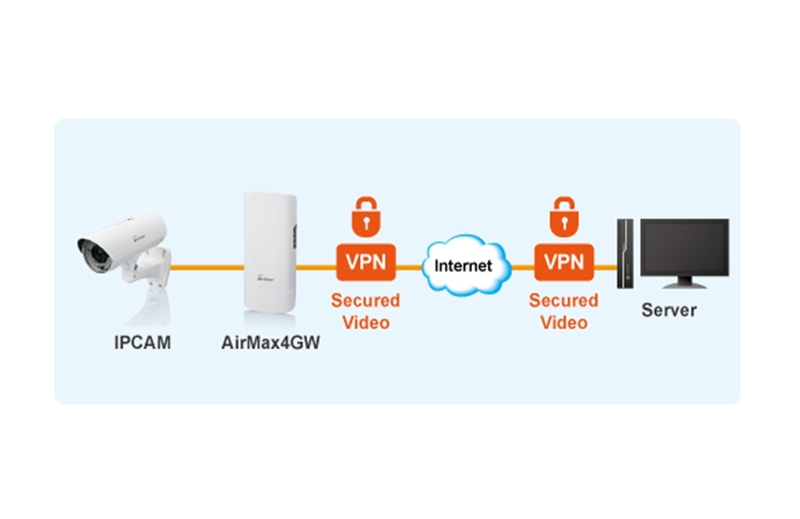 AirMax4GW connects the IP cameras to remote recording server and let users do video live view anywhere from Internet. It can do so very securely by using the built-in VPN function. In many countries, people have vacation home or cottages in remote area where it is difficult to deploy wired Internet. 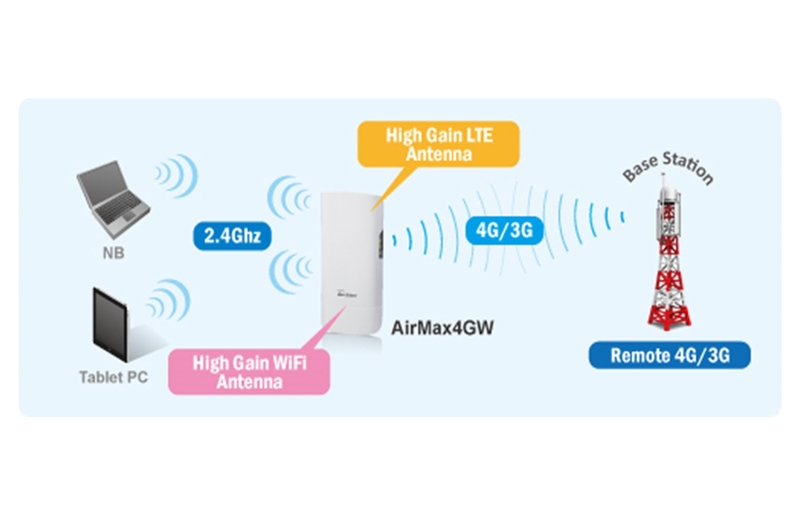 AirMax4GW can be installed on the roof top where it can get the best 4G/3G signal reception, then bring the Internet signal through Ethernet cable to the home. 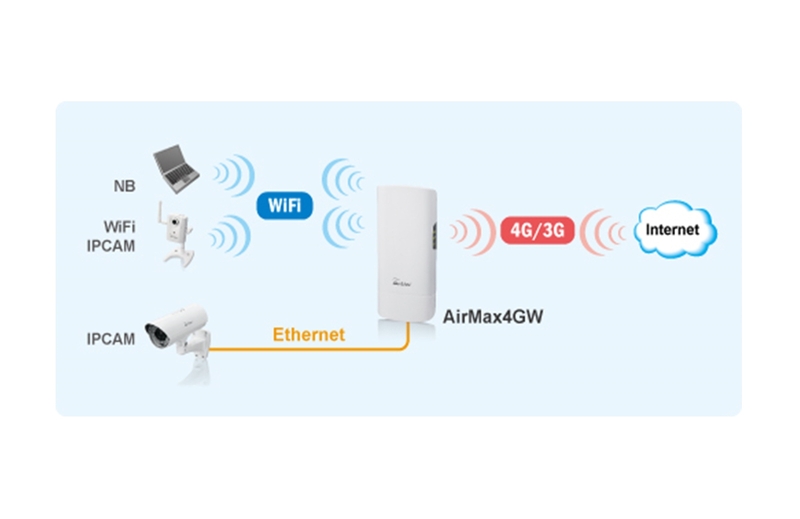 Best of all, AirMax4GW's built-in 300Mbps MIMO Wi-Fi can provide wireless connectivity to the entire outdoor area for wireless IP cameras, notebook PC or tablets. 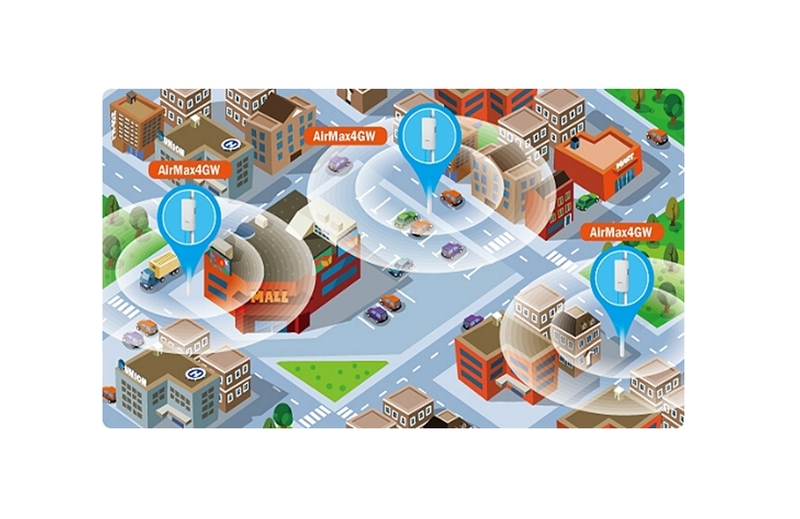 The AirMax4GW is the easiest way to deploy Wi-Fi hotspot services. There is no limitation on wiring distance or location of Internet source. It is ready for deployment in any locations. Furthermore, it support 802.1X, UAM server, and URL redirection for easy integration with the operator's authentication network. When there is Internet service needed for outdoor events such as outdoor concerts, camping, sports event, flea market, business summit,and fairs; the AirMax4GW is the perfect solution for quick deployment. Its powerful and sensitive antennas can receive 4G/3G signal far better than mobile phones and deliver the WiFi over large area. 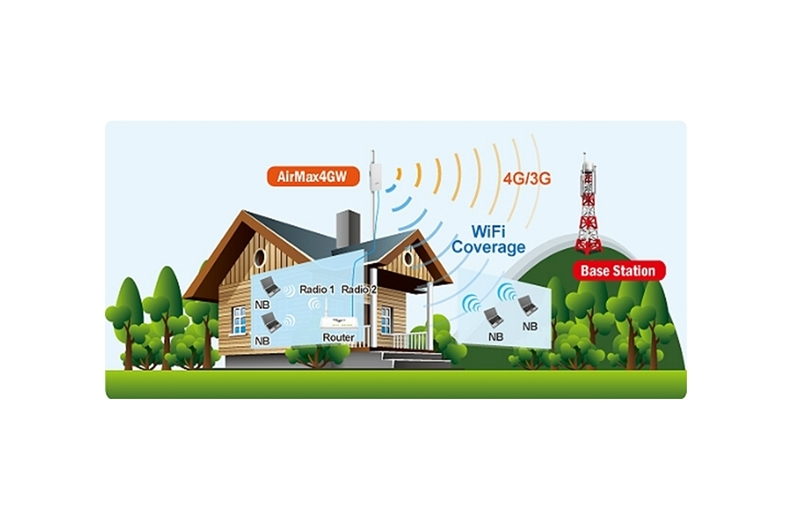 The AirMax4GW is the best solution to provide WiFi internet in locations where wires are either prohibited or expensive to deploy. 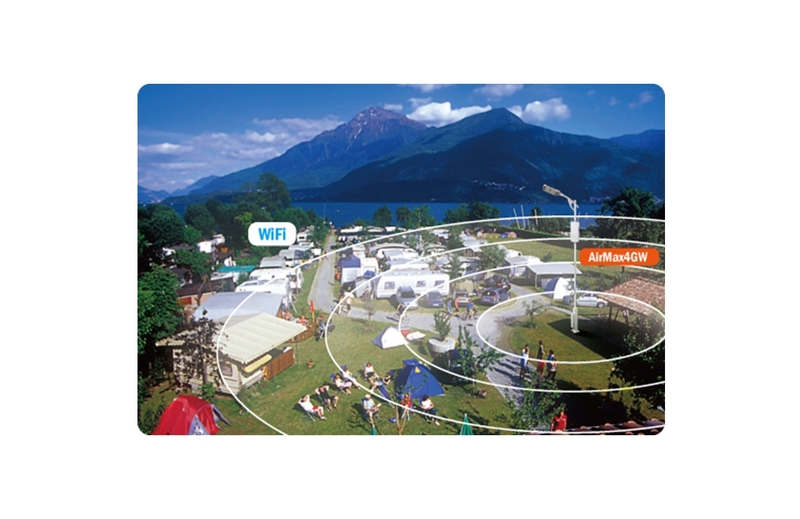 This can be for vacation homes, park, camping site, golf course, or city wide WiFi service deployment. AirMax4GW's enterprise class firewall let administrators control the user's access exactly as needed. You can define the bandwidth and QoS for each device and user to guarantee or limit the bandwidth. You can limit access to certain website or ban certain P2P application from running. The AirMax4GW's VPN function provide secure video transmission over VPN encryption. Therefore, you do not need to worry about leaking sensitive information and keep live video image from prying eyes. Administrators has the choice of using IPsec, PPTP, L2TP, or GRE protocols for encryption. The captive Portal function will redirect wireless users to a specific remote landing web page where provider can show their service information and request users to enter their login information. Together with external 802.1x radius server support, it provides the possibility for WISP and Telecom vendor for authentication based Internet service. 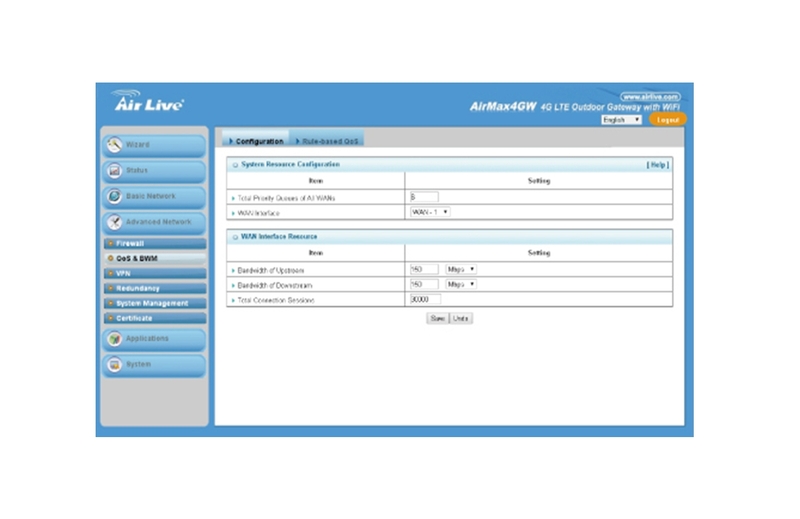 The AirMax4GW can be managed via Web, TR069, SNMP, and CLI commands. It provides the operators their preferred way for managing the device. The AirMax4GW allow the administrators to send basic commands and get status via SMS message. 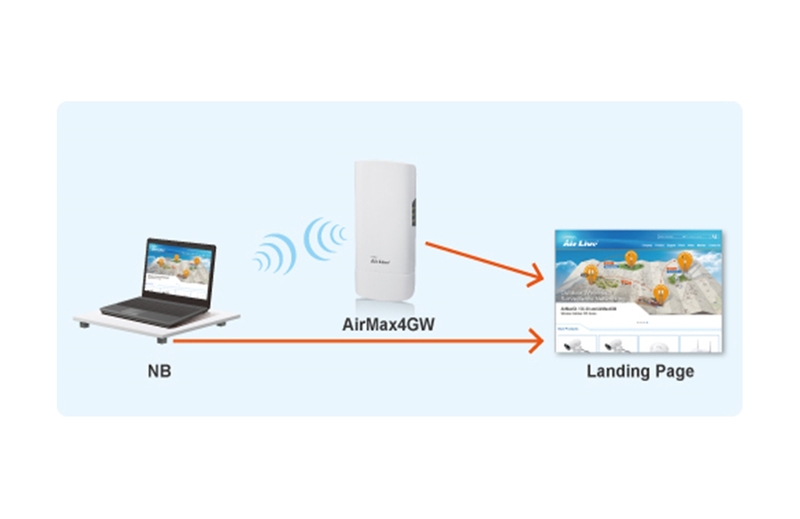 Therefore, the operators do not need to know the device's IP address and still able to do simple managements and check status with the AirMax4GW.